Topper, his black and white pinto son, became our new herd sire, and Pixie went off to work at Melody Ranch, Iverson’s Movie Ranch and Pioneer Town, among other filming locations. The Hudkin Brothers’ semi would arrive not long after dawn. It towered high above me. The tail gate was so long it had to fold when it was raised. The wranglers lowered it with pulleys because of its immense size. We’d lead him to the foot of the ramp and turn him loose. Pixie would eagerly scramble up, disappearing inside the huge, dark interior, sometimes joining other horses, sometimes having the forty foot expanse all to himself. The wranglers would wench the tail gate back up and off they’d go. At night, they’d return him to us, safe and sound. 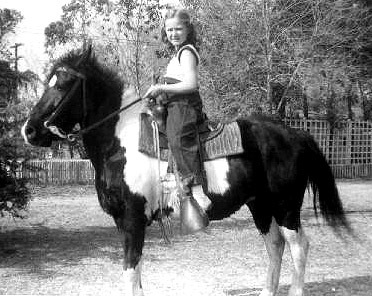 He starred as Tagg Oakley’s pony alongside a palomino gelding, Target, that Annie Oakley (Gail Davis) rode. Jimmie Hawkins played Tagg, but most of the riding was done by his stunt double. Pixie was a feisty pony, which made him hard to ride even though he was well-broke. He’d learned to cow kick when a child tried to mount. This scared away most kids. When he tried it with me, I just kept getting on and off until he grew bored and quit. He never tried that again with me, but he did try rubbing my leg on the side of the barn. He’d refuse to leave, whirling back and rubbing hard as he turned. When he realized I was ready for him and simply picked my leg up, he quit. His attitude changed at that point. It was as if he was satisfied I was a good enough rider for him to accept me. I noticed that the boy who rode him on the set always swung into the saddle. I often wondered if that was because he was avoiding the kick or because it was so much more exciting on film. Pixie, a Welsh-sized pinto, loved to run, a trait he inherited from his sire, Silver, who won many a pony race at fairs. We won a lot of races too, chased a lot of jack rabbits and had a blast practicing ring spearing and other gymkhana games. His speed made him perfect for chase scenes, except he kept outrunning the horses. At the end of the video shared here, the pilot episode, Pixie ran right past Target as they ran down main street of Melody Ranch’s movie town. In other episodes, he caught up with and passed the outlaws’ horses. Those were edited out. How would it look if the bad guys were so easily caught? In order to equalize their speed, they took to letting Target get a good head start before they asked Pixie to join the chase. If you watch close, you’ll also see Pixie kicking out as he runs. He hated spurs, really didn’t need them, but the director insisted they had to be worn. That’s what the TV viewer expected to see on a cowboy, so they were a standard part of the cowboy’s regalia. They eventually found a second pony for close up scenes who was quieter and easier to ride. Jimmie could ride this pony quite well with no problem. Although this second pony isn’t in the pilot episodes, he can be recognized in later episodes because he had a lot more white and less black than Pixie. Pixie’s intelligence was well-noted on the set. In many scenes, the script called for him to do various things at liberty. In one story line, Tagg was hurt, lying unconscious. The script called for Pixie to try to wake him up and then run for help. To induce him to “wake” Tagg, grain came in handy. With only a little bit of coaching, Pixie nibbled at a few tidbits close to Tagg’s head, making it look like he was nuzzling Tagg. When those were gone, he pushed with his nose to roll Tagg over, knowing there were more oats underneath. The second part of the script was a bit more worrisome. Because he was fast, the crew was worried Pixie would run off, and they wouldn’t be able to catch him. But they worried for nothing. After being led down the tracks once and learning where the bucket of grain was located, he never hesitated. As soon as they turned him loose, he galloped straight between the rails, never veering right or left even though he could easily have jumped those silvery guides. They got the shot in one try. After the series was over, Pixie went back to the job he’d always had: working the pony track and pulling a pony cart filled with children. He was a favorite in both roles. At work on the carnival, he was as gentle as he was feisty everywhere else. Kids appreciated his beauty, as did their parents. He’d stand patiently while their cameras flashed. He knew he’d get a chance for his reward; he loved their popcorn and cotton candy, grabbing the goodies as soon as they weren’t looking. He even managed to steal quite a few sno cones. He lived out his life still ruling over the herd, even though he was no longer the sire. Not a single horse or pony argued with him, not even Topper.